Anomodontia is an extinct group of non-mammalian therapsids containing many species from the Permian and Triassic periods (possibly continuing into the Early Cretaceous), most of which were toothless, possibly endothermic herbivores. Anomodonts were very diverse during the Middle Permian, including primitive forms like Anomocephalus and Patranomodon and groups like Venyukovioidea, Dromasauria, and Dicynodontia. Of these, only the dicynodonts survived beyond the Middle Permian. 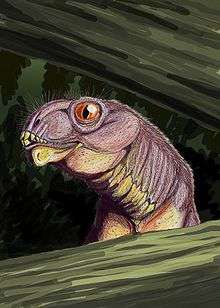 Dicynodonts became the most successful and abundant of all herbivores in the Late Permian and Triassic, filling ecological niches ranging from large browsers down to small burrowers. Few dicynodont families survived the Permian–Triassic extinction event, but one lineage evolved into large, stocky forms that remained the dominant terrestrial herbivores right until the Late Triassic, when changing conditions caused them to decline. Below is a cladogram from Kammerer et al. (2013). The data matrix of Kammerer et al. (2013), a list of characteristics that was used in the analysis, was based on that of Kammerer et al. (2011), which followed a comprehensive taxonomic revision of Dicynodon. Because of this, many of the relationships found by Kammerer et al. (2013) are the same as those found by Kammerer et al. (2011). However, several taxa were added to the analysis, including Tiarajudens Eubrachiosaurus, Shaanbeikannemeyeria, Zambiasaurus and many "outgroup" taxa (positioned outside Anomodontia), while other taxa were re-coded. As in Kammerer et al. (2011), the interrelationships of non-kannemeyeriiform dicynodontoids are weakly supported and thus vary between the analyses. Thulborn, T. & Turner, S. 2003. 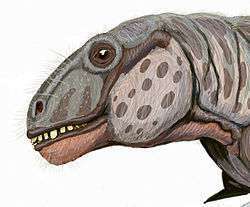 The last dicynodont: an Australian Cretaceous relict. Proceedings of the Royal Society of London B 270, 985-993. Abstract. 1 2 Liu, J.; Rubidge, B.; Li, J. (2009). "A new specimen of Biseridens qilianicus indicates its phylogenetic position as the most basal anomodont". Proceedings of the Royal Society B. 277 (1679): 285–292. doi:10.1098/rspb.2009.0883. PMC 2842672 . PMID 19640887. 1 2 Kammerer, C. F.; Fröbisch, J. R.; Angielczyk, K. D. (2013). Farke, Andrew A, ed. "On the Validity and Phylogenetic Position of Eubrachiosaurus browni, a Kannemeyeriiform Dicynodont (Anomodontia) from Triassic North America". PLoS ONE. 8 (5): e64203. doi:10.1371/journal.pone.0064203. ↑ Kammerer, C.F. ; Angielczyk, K.D. ; Fröbisch, J. (2011). "A comprehensive taxonomic revision of Dicynodon (Therapsida, Anomodontia) and its implications for dicynodont phylogeny, biogeography, and biostratigraphy". Journal of Vertebrate Paleontology. 31 (Suppl. 1): 1–158. doi:10.1080/02724634.2011.627074.